The victim has since been discharged from the Akyem Wenchi Salvation Army Health Centre. Narrating the sad incident to the Mirror, a police source said that Gyamfuaa rented a room belonging to Kumaniwaa at Sanaahene, a suburb of Akyem Wenchi. A little misunderstanding ensued between Adwoa and Gyamfuaa which nearly developed into a fight. Adwoa subsequently informed the conduct of Gyamfuaa to her daughter, Gifty, who stormed the house at Wenchi and angrily confronted Gyamfuaa about the issue. She reportedly slapped Gyamfuaa several times. However, when Gyamfuaa decided to retaliate, the other family members, Adwoa, Hagar and Irene, the daughter of Gifty, together attacked Gyamfuaa and subjected her to severe beatings. 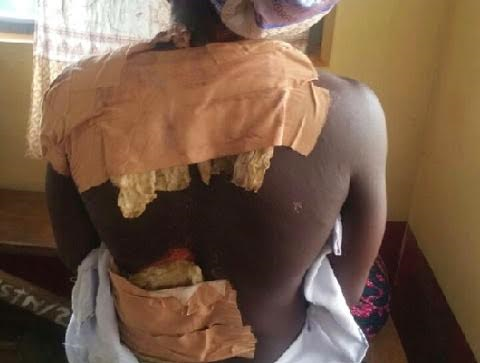 Hagar then allegedly poured the hot water which Gyamfuaa was boiling on her back. Gyamfuaa, who got seriously injured, screamed for help which attracted some people to the scene. She was rushed to the Wenchi Salvation Army Health Centre where she was admitted for treatment. After reporting the matter to the police, the suspects were all arrested. Station Officer of the Takrowase Police Station, Inspector Ebenezer Asante Ampadu, said the four suspects have so far been granted bail by the Kade District Magistrate Court to reappear on Monday, March 20, 2017.